Do you ever get cravings for a giant colorful salad? I sure do. 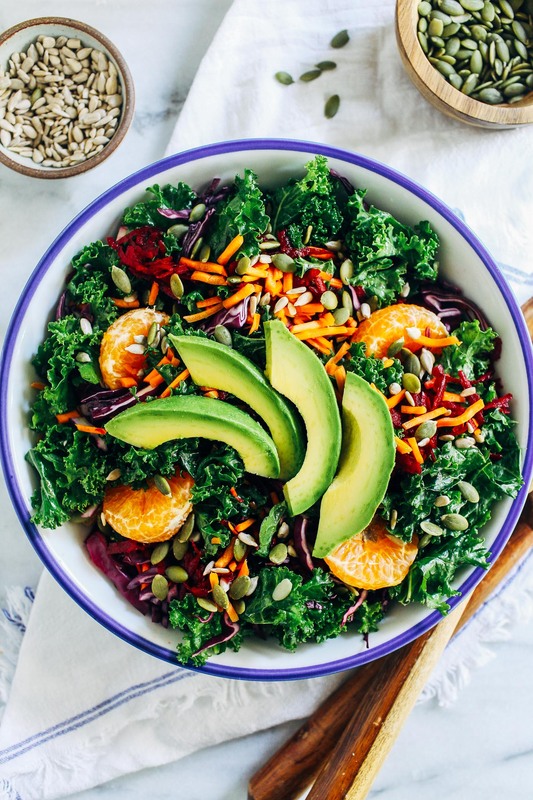 I also crave sweet and salty treats (and frequently give in to those desires) but I’ve managed to find a balance where I allow myself those things in moderation and still find happiness in a big bowl of greens. There’s actually new science that suggests that the bacteria in our guts is what controls our cravings and that those bacteria survive based on what we feed them. Meaning that if you eat a bunch of crap, that’s what you’re going to crave. The bright side is, the more you nourish the good bacteria with healthy plant fiber, the more you will come to desire those foods. It’s only a matter of time. I’ve definitely found that to be true for me. Foods that I used to be appalled by are now staples in my diet, and vice versa. 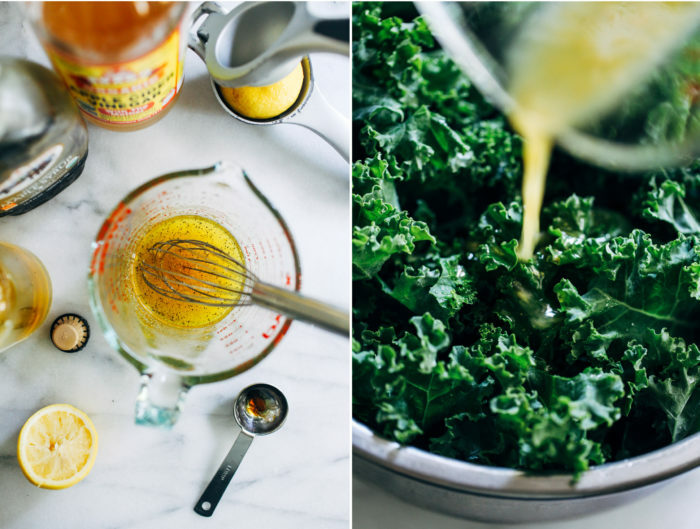 Goodbye chicken nuggets…hello kale salad. What makes me most happy is when I can find a restaurant that excels in creativity and flavor without comprising the integrity of the food. During our recent trip to Asheville we ate at a local spot that walked that line perfectly. Green Sage Cafe isn’t strictly vegetarian or vegan but it was created with a mission to serve nourishing, sustainably produced food and as a result, many of the menu items happen to be plant-based. We loved it so much that we ate their twice during our visit and there’s doubt we’ll go there again when we return in October. It’s the kind of meal that you feel good after eating, not bloated and bogged down. 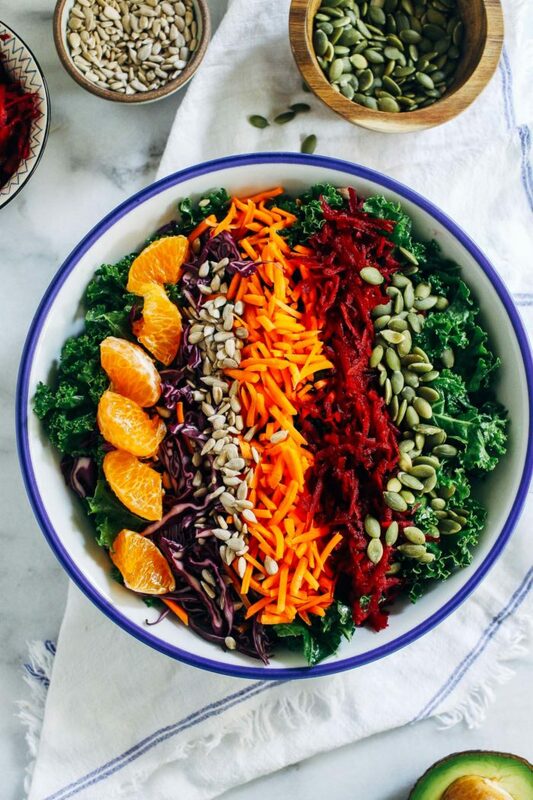 One of my favorite items was their citrus kale salad which I recreated with this recipe. I felt so refreshed and energized by it that I knew I wanted to make it again to share with you. 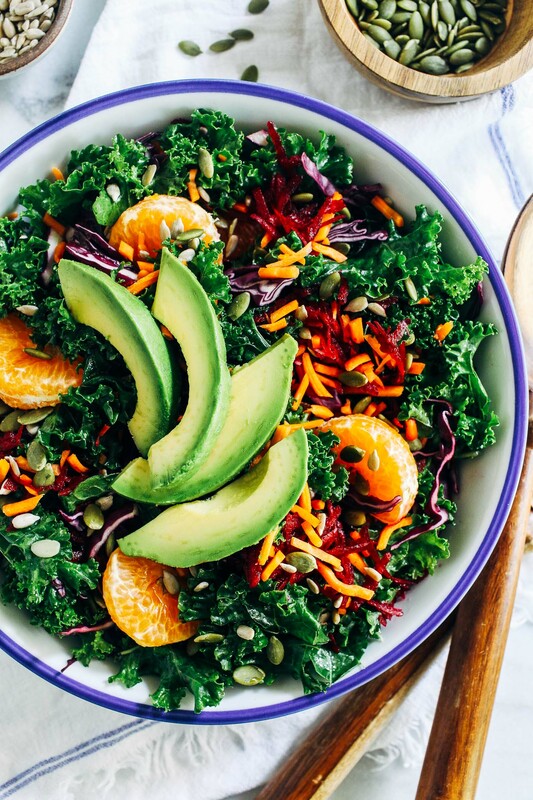 Between the vitamins and fiber in the kale and red cabbage, the protein and minerals in the pumpkin and sunflower seeds, and the healthy fats in the avocado, it’s just as satisfying as it is nourishing. This recipe makes about 4 large, meal-sized salads or 8 small side salads. Because it stores so well, I prefer to prep it for lunch and then serve with avocado when I’m ready to eat. I used mandarin oranges but you can substitute whatever fruit you like best in it’s place. Apple would work great, especially since they’ll be in season soon! 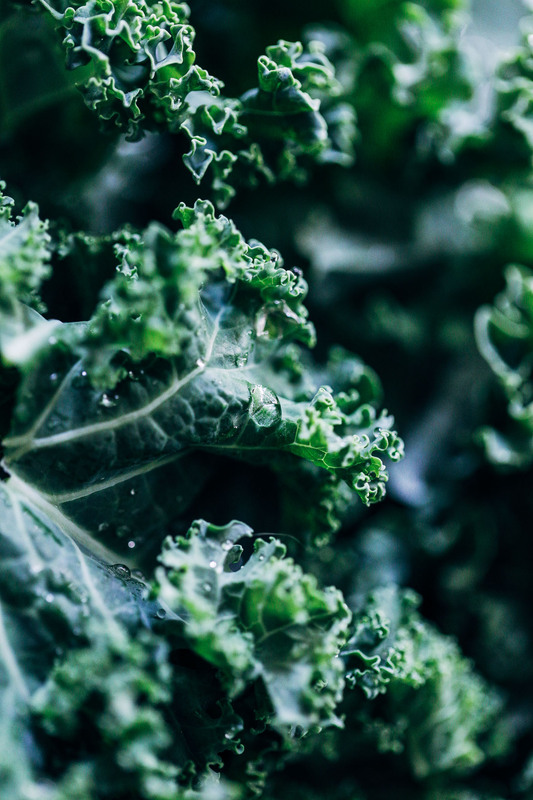 Place the chopped kale in a large bowl. In a measuring cup, whisk together the ingredients for the dressing. Pour the dressing over the top of the kale then use your hands to massage it into the leaves. The kale should reduce in size. 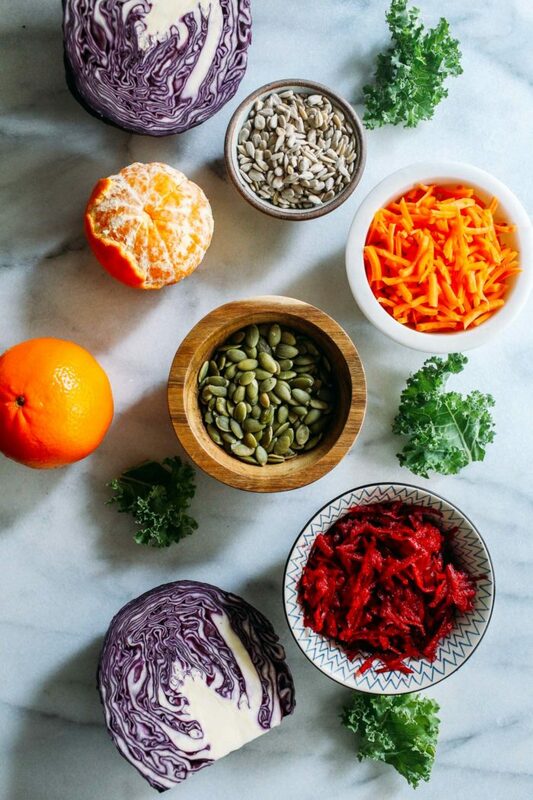 Add the cabbage, beet, carrot, pumpkin seeds, and sunflower seeds to the bowl then toss to combine. 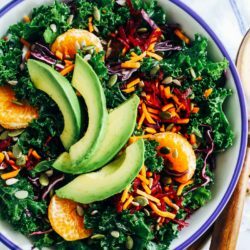 Top with orange segments and sliced avocado, serve and enjoy! Leftovers can be stored in an airtight container for up to 3 days. 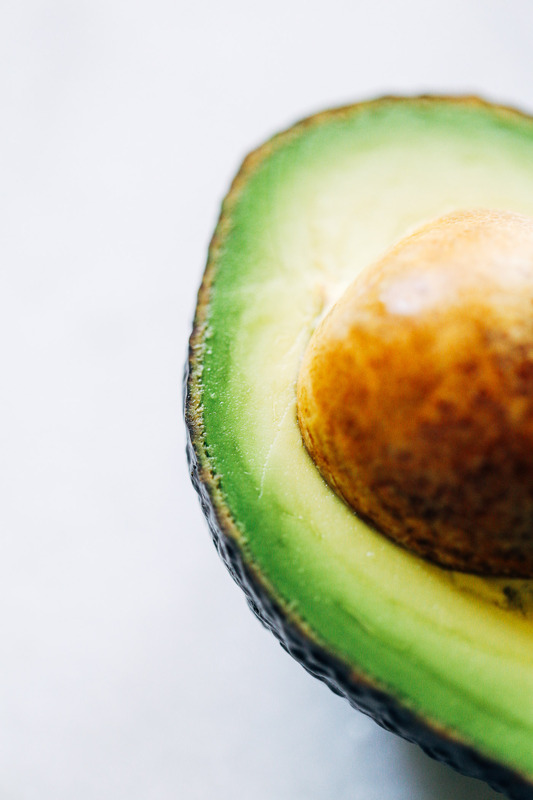 Wait to top with avocado until ready to serve.